Transformed by a Kree psyche-magnitron, Carol Danvers became Ms. Marvel and developed a wide array of super-powers including flight, strength, energy absorption and more! Ms. Marvel has been around since the '70s, but it was only after 2005's "House of M" crossover that she actually got cool. This Minimate does a nice job of persenting her modern incarnation. It's not just that she's wearing the "black swimsuit" costume, since Dave Cockrum designed that in 1978 - it's the particular expression her face suits her current self-confidence. The anatomical styling on her costume is done very well, both front and back. 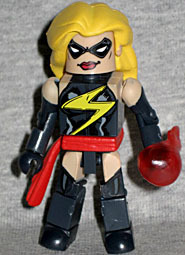 Her sash comes from Iron Fist, and so do the energy blasts included with the set: there are two of them, and they really work for either Carol or her foe, Ultron. Created to attack the Avengers, Hank Pym's plan to deactivate the robotic villain and save his friends backfired - creating one of the Avengers' deadliest threats. Way to go, Hank! The original Ultron looked like a Shop-Vac on tank treads, but this the more familiar version. Well, "one of" the more familiar versions. 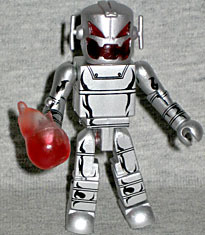 Ultron-5 was the first to appear humanoid, and he's been that way (more or less) ever since. The last one to be named was Ultron-18, so this version could realistically be anywhere in between. The Minimate is painted silver - if you take parts off, you'll see that the hips are red and the torso is green, so yeah, that's all paint. Here's a fun fact: the first-ever mention of adamantium isn't in relation to Wolverine's claws, it referred to Ultron's outer body. The head is a unique mold, with the proper shape for the eyes and mouth - yes, we're pretty much going to harp on that forever. The head is actually molded from translucent red plastic, then painted. There's a bare patch in the back in an effort to create light-piping, but the effect is nullified by the ball of the neck joint, which blocks too much of the light for it to be effective. With a strong female character and a major Marvel villain, this set is a winner. This entry was posted in Art Asylum, Marvel, MMMR and tagged Avengers, Minimates. Bookmark the permalink.